On the Comex market in New York copper for delivery in May climbed as much 4.3% to $2.3040 a pound or some $5,078 a tonne before paring some of those gains. 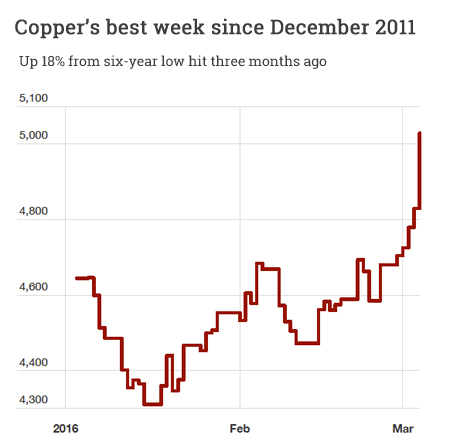 Up 7% on the week it’s copper’s best weekly performance since December 2011. The red metal is also up more than 18% from a six-year low hit mid-December. Other industrial metals also gained led by zinc which rose to a five-month high of $1,857 a tonne while nickel climbed more than 2% to $9,340 a tonne on the LME. Nickel was last year’s worst performing metal with a 40% decline but has recovered 15% from multi-year lows struck in November. There was a broad advance among mining’s heavyweights with Bloomberg data showing the strongest rally for metal and mining shares since 2008. Significantly the rerating of miners comes despite widespread dividend cuts and dire warnings of looming bankruptcies in the sector. Vancouver’s Teck Resources (NYSE:TCK) up another 5.8% on Friday for a $4.6 billion valuation has doubled in value since the start of the year. The Vancouver-based company is Canada’s largest coal, copper and zinc producer and has invested heavily in the oil sands. Anglo American (LON:AAL, OTCMKTS:NGLOY) continued its recovery adding 9.5% in New York almost matching the much smaller Teck’s rise with a 86% year to date advance hitting a market value of $11.7 billion. Anglo, the world’s fifth largest publicly held mining company in terms of output, has embarked on a radical downsizing program to reduce the number of mines it operates from 55 to a mere 16. 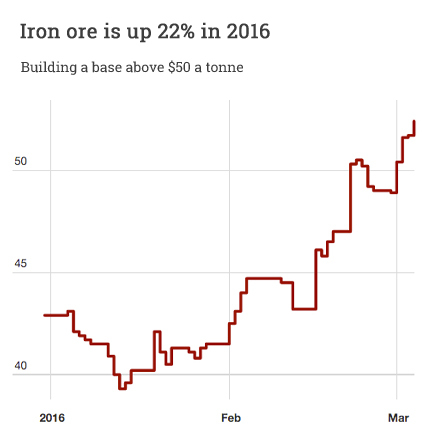 Shares in Vale (NYSE:VALE.P), the world’s top iron ore producer, jumped 7.2% in New York. The Rio de Janeiro-based company is up 55% for the week for a market value of $23.1 billion marking its best five days of trading since 1999. The world’s second largest miner based on revenue Rio Tinto (NYSE:RIO) added 4.9% in New York affording it a market cap of $55 billion. 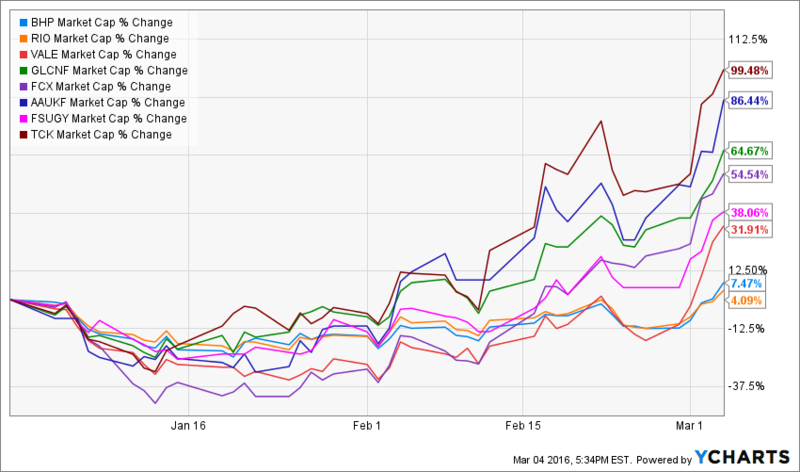 The Melbourne-HQed company’s gains for the year is modest, but the stock never quite plumbed the same depths as its peers in recent months.